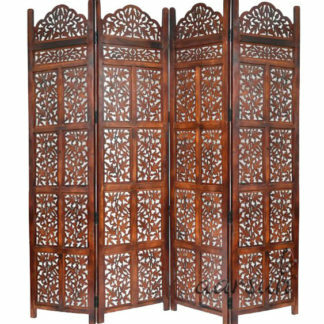 Aarsun Woods bring you this Handmade Folding Partition Screen / Room Divider made from premium quality Mango Wood & MDF with circular jaali work that gives an elegant and traditional look (matte finish) to your living room. Consists of 4 Panels each of 72″ Height and 20″Width. This stylish partition separates the living room area from the rest of the house or can be used for separating Puja Space from the rest of the house. Add a classy feel to your living room. 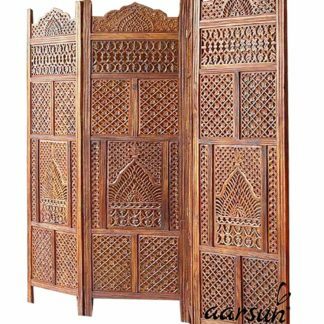 A superb way of improvising your home decor and creating privacy in your living room and bedroom with the Room Divider from Aarsun woods. The room divider is easy to clean and maintain. 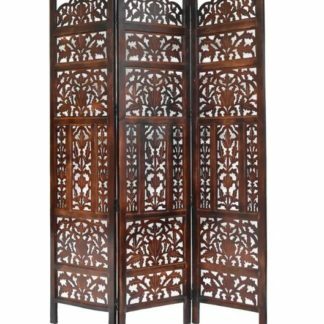 The elegantly designed divider is trendy with fabulous designs and made of Fine Mango wood & MDF.Give a soothing demarcation to your dining space or separate the TV area from the sitting room with this lovely Room divider.Go for this trendy option to decorate and bring convenience to your modern home. Place your order here with us, Aarsun Woods spices up Indian Homes every 45 seconds that makes us India’s leading Furniture and Home Decor destination.A number of designs available in fine wood. Can be customized as per your requirement. Contact us in case you need any other size or design.